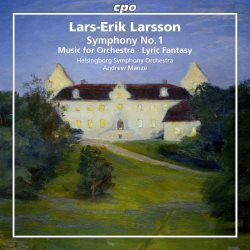 One of my recent discoveries is the music of Swedish composer Lars-Erik Larsson; I was particularly taken with the Helsingborg/Hans-Peter Frank recording of the First and Second Symphonies which, inexplicably, hasn’t been reviewed on these pages (BIS-CD-426). The gorgeous blend of Sibelian grandeur and a gentler, more winsome character confirms Larsson as a fresh and original talent who prowled a craggy northern landscape dominated by Nielsen and Sibelius. That’s why I wasted no time downloading this inaugural volume in CPO’s projected Larsson cycle. In particular I was keen to hear the fillers, all of which are new to me. At the helm is the British conductor Andrew Manze, who is probably best known for his HIP-inspired performances of baroque and classical works. That said, he’s since strayed further afield; indeed, I much admired his conducting of Thomas Adès’s Violin Concerto and other works (review). He brought to those performances a clarity of thought and generosity of spirit that should chime rather well with the music of our genial Swede. As for the Helsingborg orchestra their BIS account of the First Symphony shows they’re quite at home with the thrust and shape of this surprisingly assured early opus. That earlier recording, made in 1988/89, is a good example of BIS’s big, meaty sound of the period, and that too serves Larsson rather well. The CPO version is even more impressive; for instance there’s a remarkable degree of inner detail that doesn’t always come through on the BIS one. That could have as much to do with Manze’s ear for, and insistence on, such things; in any event it underlines the sheer completeness of Larsson’s craft, which goes far beyond those grand – very grand – gestures. Rhythms are nicely articulated – something I appreciated very much in the Adès – and there’s a structural integrity to this performance – a rock-solid certainty – that augurs well for the rest of this project. I was mildly disappointed to find that this download is only available in 16-bit – the disc is a hybrid SACD – but really that's not a big issue. The CPO sound is high, wide and handsome, with startling presence and a thrilling jolt to the symphony's percussion-capped peaks. So, no audio nasties to speak of, just effortless music-making in a warm and gracious acoustic. The fillers are no less appealing. The Shakespearian vignettes are especially delightful; the opening Siciliana is levitating and light-shot and the Intermezzo is affectionately pointed and persuasively propelled. These are little gems, and I doubt they’d sparkle any more seductively than they do here. Indeed, the rubied lustre of the Epilogue will take your breath away, such is its poise and elegance. By contrast the three-movement Music for Orchestra has a gravitas – more rigour, if you will – that doesn’t entirely quell Larsson’s Romantic spirit. Most pleasing, perhaps, is the range of colour and nuance that Manze finds in this score; bland or dry this isn’t, and Larsson's urgent rhythms are as crisp and clean as one could possibly wish. I was also struck by the sophisticated recording, with growling brass, silken strings and a satisfyingly taut bass. Manze’s choice of tempi seem absolutely right too, as demonstrated by the all-binding beat at the heart of the Andante elegiaco. I’m beginning to think the music of Lars-Erik Larsson is one of Sweden’s best-kept secrets; when it’s played with this level of commitment and insight it deserves a place alongside that of Denmark and Finland’s finest; don’t take my word for it, just sample the closing Allegro, which has all the confidence – a perfect balance of form and content – that we tend to associate with Larsson’s more illustrious rivals. Even his smaller-scale pieces – the Pastoral and Lyric Fantasy, for instance – teem with deft invention and quiet loveliness; as if that weren’t enough it’s all captured in sound of uncommon fidelity and reach. Heartfelt huzzahs all round. When it comes to the First Symphony the BIS recording is not easily dislodged; besides, it has the advantage of an equally arresting performance of the Second Symphony. That said, both releases are highly desirable, and both deserve a place on your shelves. Music of substance and stature, eloquently played and beautifully recorded; a new and significant journey has just begun.